Present were representatives of the Pan-American Health Organization, Guatemalan Ministry of Health, Office of the President and Guatemalan Rotarians. Participants discussed the ongoing operation of the world's first WHIS-RAD digital x-ray equipment installed at the Municipality of Guatemala City Clinic. The Guatemala Minister of Health, Dr. Ludwig Werner Ovalle Cabrera, and his staff provided a well-organized, comprehensive report that justifies country-wide installation of 29 digital x-ray systems networked into six regional hospitals. The final highlight of our weekend in Guatemala was the dedication of the pilot digital x-ray installation in Guatemala City. It featured three speakers, the head of municipal health for Guatemala City, Deputy Mayor of Guatemala City, and me, speaking on behalf of Rotary, including our six District 6440 sponsoring clubs: Arlington Heights Sunrise, Des Plaines, Evanston, Mt. Prospect Sunrise, Mundelein-Vernon Hills, and Park Ridge that are named on the brass plaque at the entrance to the clinic. Also, I am pleased to announce that PDG Pam Kerr will serve as the District 6440 Project Coordinator of an expanded district committee for what promises to be a Bigger, Better and Bolder project. 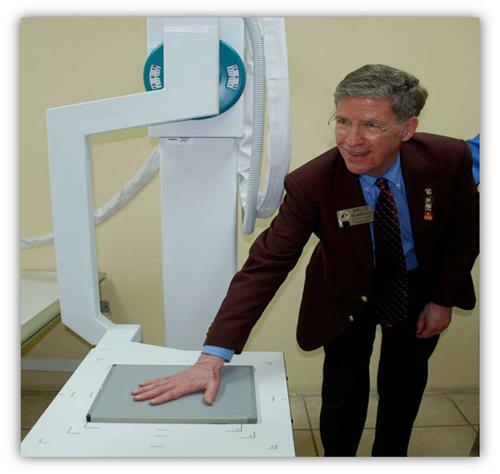 John Vanden Brink (Park Ridge), the person with the passion who has worked on the development of the WHIS-RAD digital x-ray technology for over ten years, is our diagnostic imaging expert. He will continue as a very important member of of the project team providing the necessary guidance and expertise. The Guatemala Digital X-Ray Project is an excellent example of our clubs' global humanitarian assistance to "Build Communities and Bridge Continents."